Quality, sustainably-sourced Hardwood Firewood sold loose or netted. Size: 20cm (8″) blocks, easy to stack. This firewood is made from a mix of high quality hardwoods, cut into 20cm (8″) regular blocks. It is freshly processed (unseasoned), and will need stacking (indoors or in a log shed) for a few weeks/months, depending on the season, before it will be ready for you to use. Perfect to buy in the summer for you to store ready for the winter! We offer a stacking service, at £15/hour per person stacking (please add to the notes when you place your order). 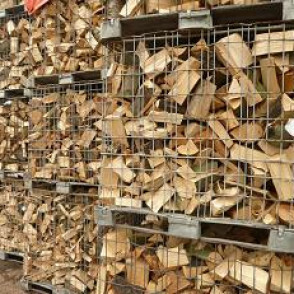 Depending on your home layout, 1m3 costs roughly £30 – buying our firewood netted and storing these away yourself may work out cheaper!